Our Philips Corepro LEDspot 5W-50W GU10 is a fully dimmable LED Spotlight that is a direct replacement for a 50w Halogen GU10 Spotlight it produces a 4000 Kelvin very warm white light. The 36 degree beam angle means it is ideal for general spotlighting applications. 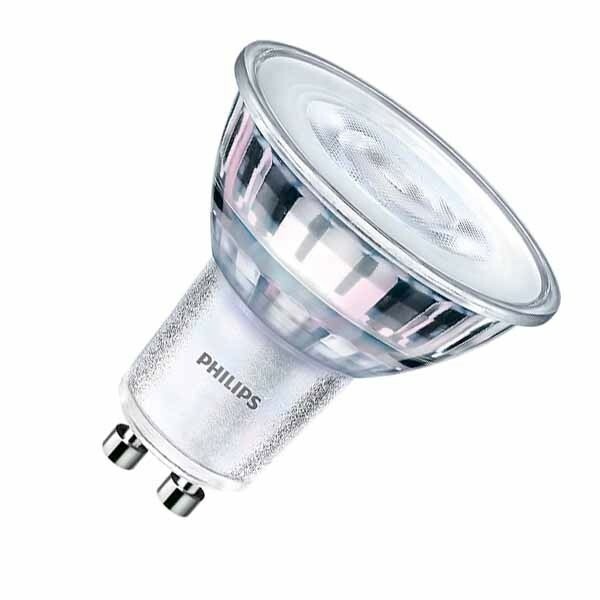 Giving the same light output as a 50w halogen, our 5W LED Spotlight from Philips offers an 80% saving in electricicty when compared to its Halogen equivalent. The expected life of our Philips Corepro LEDspot is 15,000 hours before replacement. We also supply this product in warm white 2700K and cool white 4000k versions. Low maintenance and great energy savings make this our best buy LED GU10.